I’ve officially survived the first week and some change of grad school, and came out without a scratch! Maybe a corneal scratch or two, I’ve been doing a lot of reading (actually, I highly doubt that corneal scratches come from reading, and I’m pretty sure that my best friend, the optometrist, would smack me for saying such a thing). 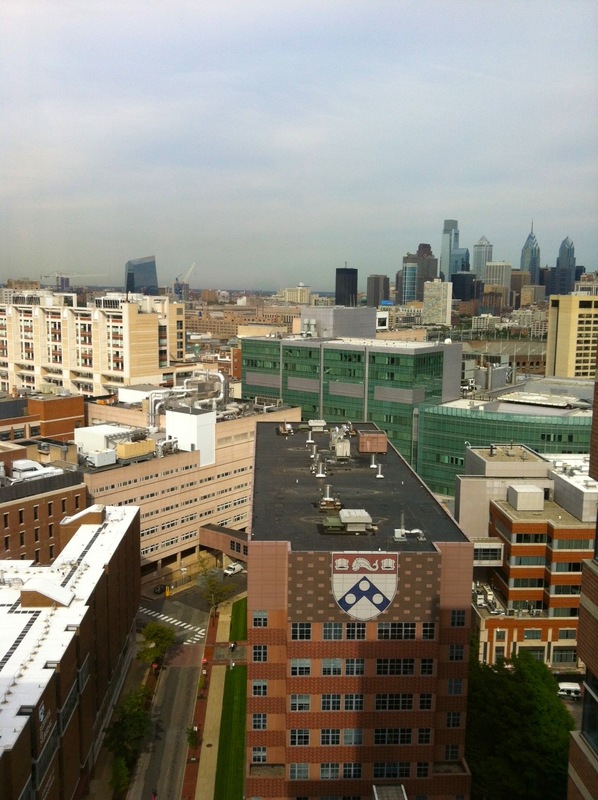 But, beyond the classroom walls, the outlining, the biostatistics, I’ve learned a few other bits and pieces on the mean smelly streets of Philadelphia. And, since I’ve been doing enough writing for school on things that might not fit into this blog (The effects of tar balls on public health! The Theory of Reasoned Action and how it influences condom use! The history of voluntary abortion in India! ), I figured I’d share a few tidbits on the blog so that each of you can get a little tutelage from little old me. 1. Have your cake and eat it, too. Or, in my case, find a place to work and workout, too. One of the major perks of working somewhere filled with like-minded athletes and fitness Barbies like myself? Workout classes IN THE STORE!! 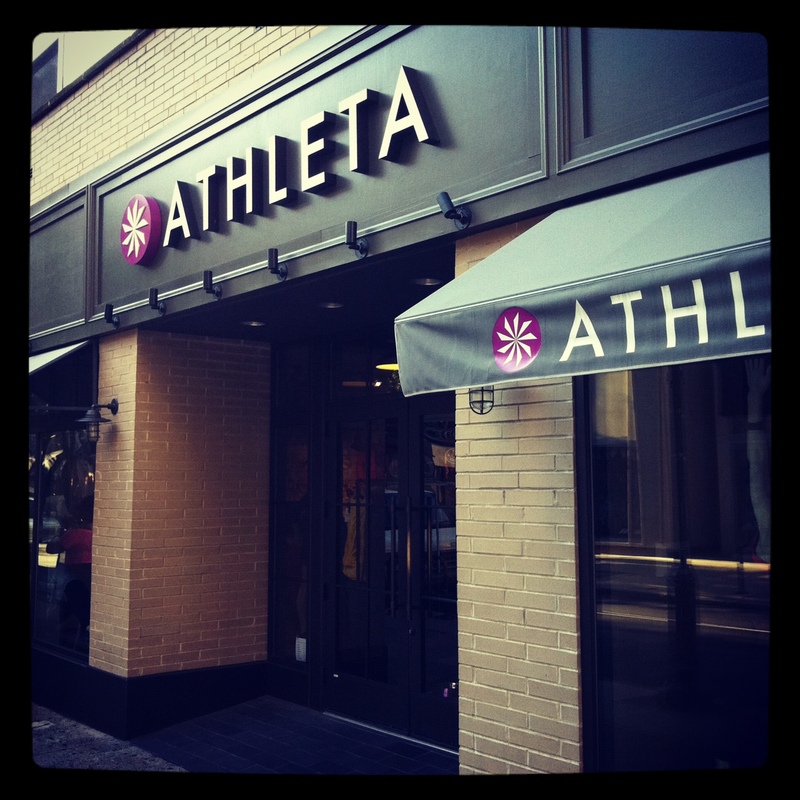 Athleta just was identified by Be Well Philly as the best place for free workout classes and, after finally trying one on Thursday morning, I can see why. In 40 minutes, I broke a sweat, burned over 500 calories AND was surrounded by adorable clothing that just screamed out “buy me, buy me!” I held off (waiting until I actually get my first paycheck, before I blow it on clothes) BUT it was definitely worth the trip over. 2. You can ALWAYS find X cheaper if you look hard enough. Deal on grapes at Whole Foods? Go to Trader Joe’s. Too expensive there? Try Superfresh. That not doing it for you? Shopping around, when you have the time, can save you a buttload. You just have to make the effort. Luckily, I’ve got the time AND am a notorious cheapskate. A dynamic combination…. 3. Be Aggressive. B-E AGGRESSIVE! Ok, maybe this isn’t going to work for everyone. And, honestly, I don’t even know if it’s working for me. BUT I’m taking a fairly aggressive approach to befriending people. If I find out their last name, I’m friending them. If I can get their number, I’ll text em. AND, if there’s a chance to interact with my peers outside of class… I’m doing it. 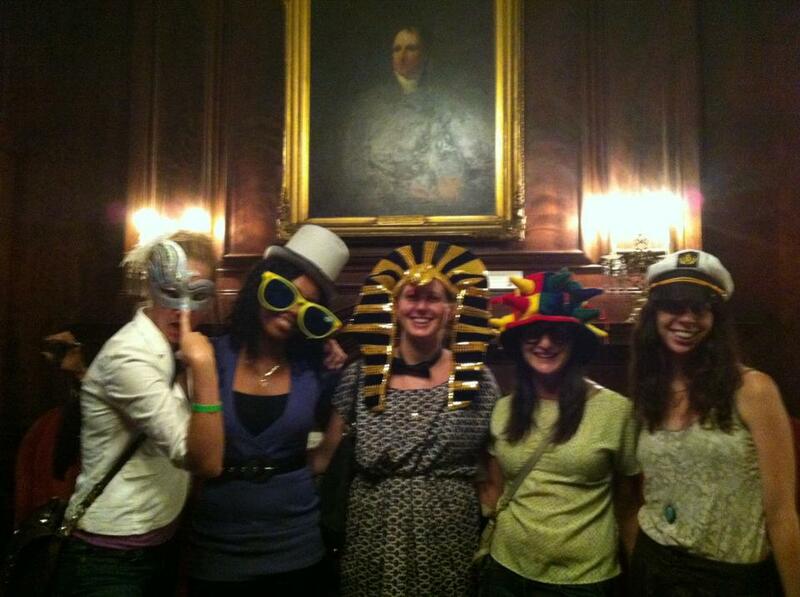 Silly happy hour photos at the Mutter Museum? I’m there. We’ll see how this goes in the long run…. Got a three hour class on the more complicated theories that form the basis for public health policy and interventions? This solar-powered dancing sunflower, which is only happy when it’s sunny out. 5. Free? I’ll take it. Yes, I know I said I’m a cheapskate. And you know what’s even cheaper than cheap? 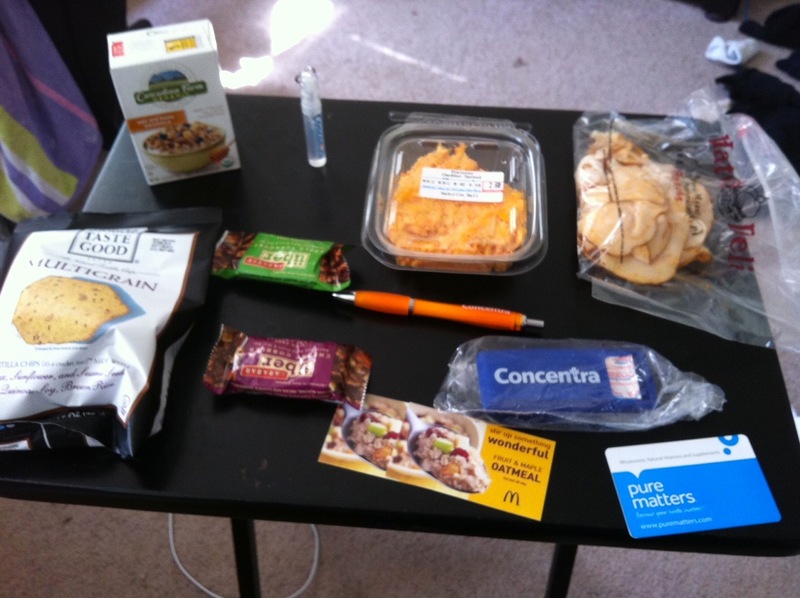 Today, I stopped at the RnR Philly expo to see what all you crazy runners were fussing about…. Then I stopped by the Reading Terminal Market for some goodies. The sum of my experience? Be resourceful, check twitter, and who knows? You might take that old phrase “No such thing as a free lunch” and flip it right on its head. Last minute bus trip to NYC for the weekend, leaving in 30 hours? Pretend that’s me in there. Jeez, living in the Northeast is easy. Agenda today? Quick trip to Rittenhouse Square for some art walking then DATE NIGHT with the beau!! Ohhh have fun in NYC! And congrats on your new job! you’re going to be awesome! Wahhhh thanks! I hopefully didn’t bungle my first shift too much. Here’s to many more successful ones! Great post! Glad you’re settling in nicely. One question… Did I miss the part in your post about pretzels? I want to know the best place in Philly to get one while I’m here! Ha, Cate, sorry I didn’t get back to this earlier BUT the correct answer is: basically any street corner. Seriously, I’ve yet to have a bad one! I got one after my race and I don’t know if it was the saltiness, but it was one of the best I’ve had! yay congrats!! how fun! And you are gonna look stylish! Basically a walking fashion show. Except most fashion shows are walking, right?